Take a journey into the deep and alternate reality of Rocket01. We are looking both in and out as we realise the world as we know it is like a terrarium moving through space- a delicate container, a fine balance of light, atmosphere and plant life being all that sustains us. Visually the work is a dreamy, atmospheric fusion of sci-fi and surrealism, with a remarkable and watery captured light. There is a strong environmental message which hints at a future of ecological ruin and the immediate need of unity between mankind and nature. Expect the large and intricately detailed canvases we have come to expect from Rocket01 as well as carnivorous plants, terrariums and schools of silvery fish. 'TERRARIUM' promises to transport your mind, if you'll allow it. From abandoned buildings in Sheffield to the streets and the gallery, this is a rare opportunity to visit a solo exhibition by the artist. 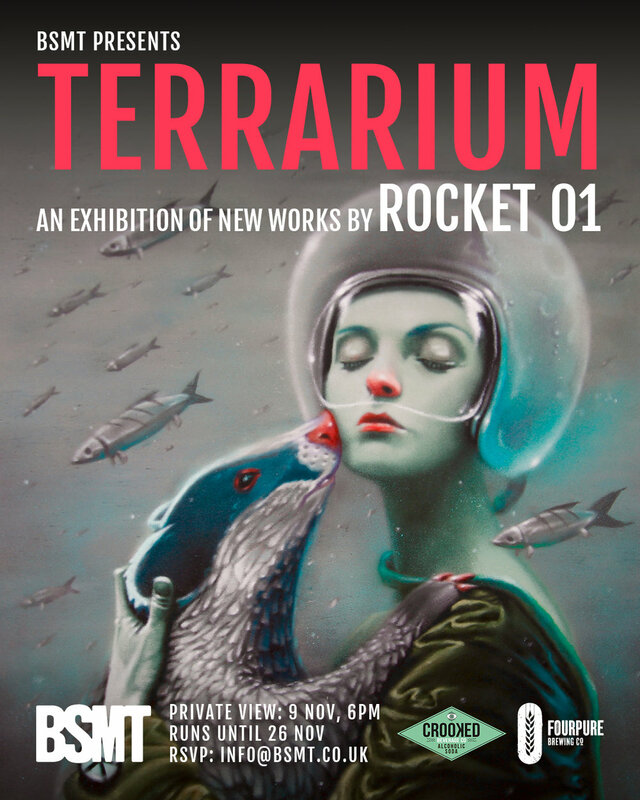 'TERRARIUM' will open at BSMT with a private view on Nov 9th, 6pm. To attend please RSVP via: info@bsmt.co.uk. Big thanks to Fourpure and Crooked Bev Co for coming on board as sponsors for the opening night.